A string of deadly earthquakes that rocked Indonesia’s Lombok island this summer killed 555 people and injured nearly 1,500, the disaster agency said on Friday, with hundreds of thousands left homeless. The picturesque island next to holiday hotspot Bali was hit by two deadly quakes on July 29 and Aug.5. 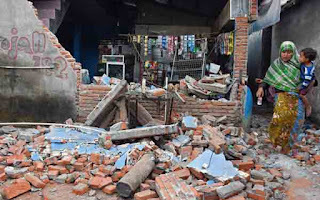 On Sunday it was shaken by a string of fresh tremors and aftershocks, with the strongest measuring 6.9 magnitude. Indonesia’s disaster agency said on Friday most of the deaths occured in the northern part of Lombok, with several also killed in neighbouring Sumbawa island. Rebuilding costs are estimated to top seven trillion rupiah ($478 million). Indonesia sits on the so-called Pacific “Ring of Fire,” where tectonic plates collide and many of the world’s volcanic eruptions and earthquakes occur.